Hear ye! Hear ye! You are cordially invited to print these royal invitations courtesy of In The Fun Lane. 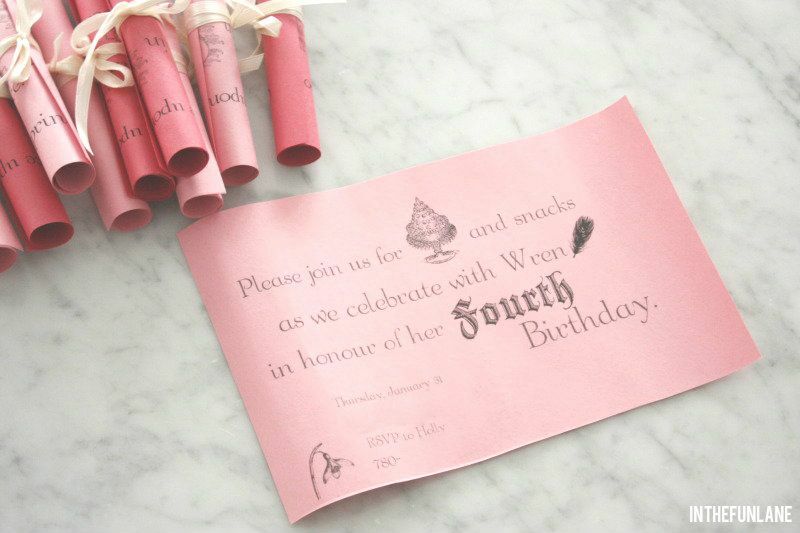 These adorable, free printable scroll-style invitations are the perfect way to set the tone for your royal event. What guest wouldn't feel enchanted when walking through this royal castle facade? It's amazing what one can do with cardboard! Want to make one of your own? Visit this storybook princess party at At Home with Natalie to find out how she made it, along with several other fabulous DIY ideas for a charming celebration. A mirror, some string lights and a bit of tulle is all you really need to create your very own, sparkly, magic mirror fit for a princess. Just drape the fabric and lights over the mirror. stand party guests in front of it and watch the magic happen. Have a royal relay race, slay a dragon pinata, make magic potion or freeze your wicked stepmother. These are just a few of the fun knight and princess party games your royal guests can enjoy. This castle cake made by Jessica Harris would make a regal centerpiece for the princess dessert table. One might never know the turrets were once just ordinary ice cream cones. Jessica covered them in purple molding chocolate and etched on the design, transforming ordinary to elegant enough for any princess. What pretty princess doesn't need a sparkling brush with which to groom her lovely hair? These princess hairbrushes from Dawn Nicole Designs are the perfect party craft that can also serve as a take home favor. Pair them with tiaras when guests have finished giving their locks a royal brushing, they can top them with a sparkling crown.